Suitable for applications including cars, vans & tractors with 12 or 24V lead-acid batteries. 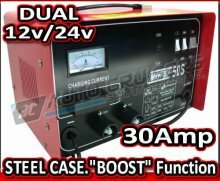 Metal cased 30 amp dual voltage battery charger. Output 12/24v - 30amp effective. Fast charge and boost functions. Suitable for cars, vans, tractors, commercial vehicles and leisure batteries. Ammeter clearly shows charging rate. Robust steel case with carrying handle. For all low maintenance and maintenance free 12/24v lead acid batteries of 120-320Ah capacity. Overload, reverse polarity and short circuit protection.